Yesterday, Israel celebrated its 61st year of independence. When detailing all that this little nation has to be proud of, modern technology always ranks at the top of the list. After all, this is the country responsible for the popularity of instant messaging on the Internet (ICQ was first developed by the Israeli company Mirabilis). I think that modern technology and the new forms of digital communication are wonderful advances that improve our world in general, and the global Jewish community in particular. They have caused borders to virtually fade into nonexistence. In my college senior thesis (The Globalization of Judaism), I argued that the Internet has (and will continue to) change the global Jewish community religiously, culturally, and educationally. As the online virtual community has grown, the actual Jewish community seems smaller and the proverbial borders have disappeared. There are many who argue that the new communication tools are a hindrance to our community. They complain that our ability to always be connected is an intrusiveness in modern life. I propose that our embrace of social networking changes our cultural community in wonderful ways. To be interconnected within our global community can lead to positive advances in all realms. My colleague, Rabbi Aaron Bergman (right) of Adat Shalom Synagogue in Farmington Hills, Michigan, wrote a very nice article in this month's congregational bulletin on the subject of always being "in touch" through modern communication technology. Rather than complaining about the intrusiveness of modern life, Rabbi Bergman writes that he embraces it. He acknowledges that through his Blackberry, Facebook page, and Twitter account, he is "able to communicate with people with common interests from around the world". He appreciates being able to reconnect with old friends and stay in regular communication with people (his congregants) when he's not sitting at his office desk. While some complain that the new technologies alienate people from each other, Rabbi Bergman theorizes that our embrace of social networking is actually a reaction to feeling alienated, not the cause of it. I agree. There are enough individuals who are negative about our society's connected lifestyle in the 21st century. Many of the same people who once railed against cellphones, now use them incessantly. Those who couldn't understand the necessity of PDAs, Blackberrys, and iPhones now can't live without them. And those who scoffed at social networking sites like Facebook and Twitter as a silly waste of time have set up their own accounts. The future is here and we are still figuring out how to best utilize the new technology. 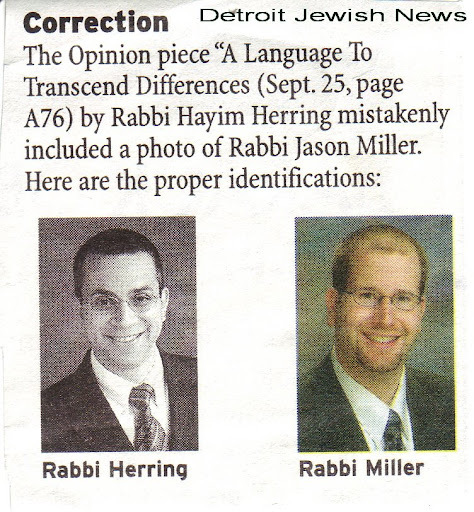 I'm glad to see rabbis like Aaron Bergman embrace these new communication tools. Many rabbis are resistant because they have yet to discover how to best capitlize on them. Together with a couple other rabbis, I've been asked by Rabbi Julie Schoenfeld, the new Executive Vice President of the Rabbinical Assembly, to consult the RA on technology issues. Together, we are trying to figure out how rabbis can best make use of these advances in modern communications. Every rabbi now uses e-mail daily, participates in e-mail listservs, and posts sermons to the synagogue website. Now, the time has come to help rabbis take the next step: using a blog to communicate with their congregants, setting up a Facebook page, teaching bits of Torah through a Twitter account, posting their sermons and lectures on YouTube, and teaching through Podcasts. 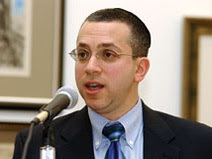 My teacher, Rabbi Hayim Herring (for whom I'm honored to be mistaken - see here), is writing a book to be published by The Alban Institute entitled Tools for Shuls: A Guide to Make Over Your Synagogue. On his blog, which functions as a virtual labratory for his book, he has a section called "Digital Dreaming: Using Technology Wisely". In it, he writes that the new communication tools and the environment are ripe for experimentations in creating new virtual Jewish communities. In fact, they are already happening. We've come a long way since my first Talmud teacher at the Jewish Theological Seminary, Rabbi Avi Reisner, raised the question of whether a virutal minyan (prayer quorum of ten) would be "kosher" if it were assembled through the virtual realm of the Internet. His teshuvah (Jewish legal responsum), "Wired to the Kadosh Barukh Hu: Minyan via Internet", is available here. Examining this thinning of language — these starved forms of communications that favor the quick and the inconsequential while remaining unsuited for thoughts that may take space to unfold and time to read — it is easy to succumb to a technologically deterministic depression and declare the end of intelligent civilization near. But since Jews have been forever defined — even constituted — by our relationship with the book and, as a result, with the written word at large, we must pay special attention to these winds of change. Without being unduly alarmist, one can say that the Internet may be killing off the Jewish mind. Whether or not, this form of communication bodes well for the Jewish people, Leibowitz is correct to assess it. We must all do this. Instead of avoiding the new technology available to us, let us find the applications that will work to our advantage and then improve our communities (synagogues, schools, organizations, etc.) for the future. There are ways to exploit new communication technology and new networking applications that will greatly enhance our global Jewish community. What are some ways in which you're doing it? • I use Facebook to communicate with a group teens who are in a weekly Shabbat afternoon study group which I teach in my home. They don’t always respond to email but they are good about communicating on Facebook. • I believe that we can be both the People of the Book and the People of the Byte. Kol Hakavod on your article and the thinking behind it. My regional office, part of a large BJE, is just beginning to experiment with Twitter as a means of getting out bite sized pieces of Jewish educational wisdom; for years, we've modeled how synagogues can empower parents to become their family's Jewish educators. Jewish institutions of tomorrow, including synagogues, will look different than the synagogues of today (most of which are actually still the synagogues of the 1950's). Social networking as a means of bringing people together is not a new concept. It's just that there are new tools. Let's learn and embrace that which helps us to be more effective in our work. Advances in technology are likely to have a disruptive effect on the status quo; yes, you can use facebook/twitter, etc., to stay in touch with congregants. On the other hand, technologies like Facebook allow people to create "virtual communities" of friends in far flung places, and it may make them less connected to the physical communities in their neighborhood.